Artificial Intelligence and technological developments are completely changing jobs, work environments and the way we work. The impact on HR is happening in most organizations and will even become more important in the future. When looking at the HR value chain, processes for talent acquisition, recruitment, talent development, staff engagement, performance management, rewards and shared services are all undergoing radical changes. What will be the future role of people in organizations and in HR in particular? HR Professionals and all those interested in people management and what it means for the future. HR - technology and people! At INL – International Iberian Nanotechnology Laboratory, located in Braga (North of Portugal), scientists and engineers from all over the world work in a highly interdisciplinary environment and strive to make INL become a world-wide hub for the deployment of Nanotechnology addressing society’s grand challenges. The INL was founded by the governments of Portugal and Spain under an international legal framework to perform interdisciplinary research, deploy and articulate nanotechnology for the benefit of society. The research programme comprises four strategic fields of application of nanoscience and nanotechnology: Food and Environment monitoring, ICT, Renewable Energy and Health. The full-fledged nanotechnology laboratory enables leading research of the highest international standard. In Braga’s railway station you can take the Bus 2 with the name“BomJesus”or no. 43with the name “Minho University” (around €1,55) or take a taxi to INL (around €6). In Braga you can take the TUB Bus 2 with the name Bom Jesus and no. 43 with the name Minho University (price around €1,55) or take a taxi right in front of the railway station or bus station (€5,00 aprox.). You can take a taxi to Braga (aprox. 85€) or to the Vigo-Guixar railway station and buy a ticket to Nine using Comboio Celta (aprox. €13) and then buy a ticket to Braga (around €1,45). In Braga you can take the TUB Bus 2 with the name “Bom Jesus” and no. 43 with the name “Minho University” (price around €1,55) or take a taxi right in front of the railway station or bus station (€5,00 aprox.). Our conference hotel is the Meliá Braga Hotel & Spa, a modern and sophisticated 5-star Hotel serving the city of Braga and the entire region. In a prime location, the Meliá Braga Hotel & Spa is located just 5 minutes walking distance from the Iberian Nanotechnology Centre and close walking distance to the City centre, shopping malls, the Bom Jesus Sanctuary, the University of Minho and the Peneda-Gerês National Park. Guests can enjoy the garden bar, outdoor swimming pool, a modern 800m2 Spa and its fine dining services which places great emphasis on serving Portuguese and international cuisine. These prices are special rates provided to INL. You will need to communicate at the time of the booking, that it is related with an event at INL and that payment is on your account. The deadline to receive the hotel conference rate is 30 June so you are advised to secure your hotel reservation as soon as possible. Rooms have been pre-reserved at the hotel for conference participants however participants are responsible for booking their own accommodation. Please contact the hotel directly via melia.braga@meliaportugal.com mentioning “2018 AHRMIO conference” as reference. Please ensure that you provide information regarding type of room required, number of guests, as well as number of nights you intend to stay. Colunata is a historical and a unique space in the Braga region. 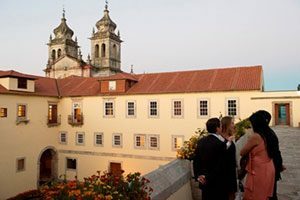 With a breathtaking view over the city of Braga and its magnificent gardens, it offers a place of charm and tranquility. 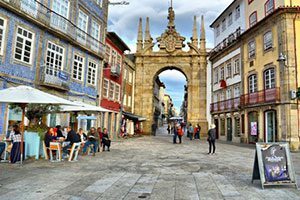 Braga is situated in the heart of the fertile Minho province in north-western Portugal, surrounded by a gently rolling landscape of mountains and forests. 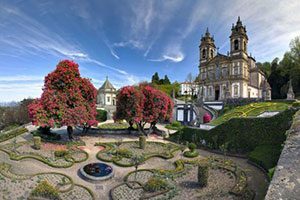 One of Portugal's main religious centres, the city is renowned for its baroque churches, splendid 18th century houses and beautiful parks and gardens. The old city is solemn and antique, although industry and commerce have brought a modern way of life, complemented by local universities, contemporary restaurants and lively bars. 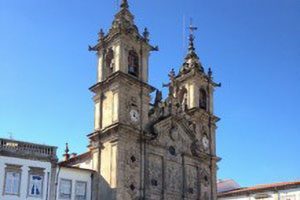 The city’s history is evident in its numerous churches and monuments, the principal landmarks including the striking Sé Cathedral and the 17th-century church of Santa Cruz. On a hill about 5 kilometres (3.1 miles) south-east stands the sanctuary of Bom Jesus do Monte, which is an important pilgrimage site. Beyond it is Mount Sameiro, where a colossal statue of the Virgin Mary overlooks the city. 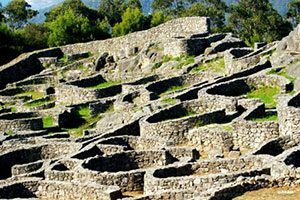 A short drive from Braga, the Citânia de Briteiros is an impressive archaeological site from the Iron Age. Beautiful, wild beaches can be found along the coast in Esposende, Ofir and Apúlia. The whole district is famous for its festivals and local gastronomy, boasting traditional recipes include codfish (cooked in hundreds of different ways) and oven-roasted duck with rice.
. Sé Cathedral In the historic centre of Braga stands the oldest cathedral in Portugal, the Sé, containing a wealth of sacred art treasures. Building began in 1070 and was influenced by a combination of Gothic, Renaissance and baroque styles. 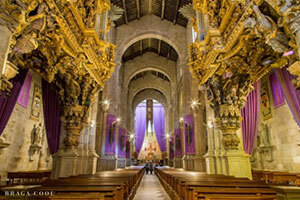 Highlights include the ornate Manueline towers and roof, as well as the carved altarpiece and twin baroque organs. The tombs of Dom Henrique and Dona Teresa, parents of the first King of Portugal are located in the Capela dos Reis (Kings’ chapel). This spiritual sanctuary is considered one of the most beautiful in Portugal. Surrounded by magnificent gardens, the neoclassical church was designed by Carlos Amarante in the late 18th century. The famous baroque stairway zigzags up to the church, featuring enchanting fountains and statues along the way. Visitors can also take the funicular (cable car) or drive to the top to enjoy the peaceful ambience and outstanding views. One of the best preserved archaeological sites in the Minho is the Citânia de Briteiros, the ruins of a Celto-Iberian settlement dating back to 300 BC. Archaeologists have discovered the foundations of more than 150 round stone huts, paved roads, cattle sheds and water conduits. Two huts have been reconstructed on site and fascinating relics are on display at the Museu de Martins Sarmento in Guimarães, including painted pottery, carved stones, weapons and jewellery. Built in the 17th century, the Santa Cruz church boasts an intricate stone façade and was designed in a baroque mannerist style. The elaborate interiors include intricate gold carvings on the organ and pulpits, a high nave and beautiful azulejo panels. 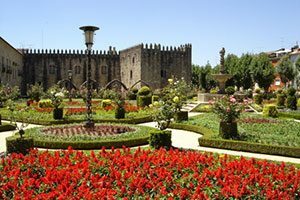 The Santa Bárbara Garden is one of the most beautiful in Portugal. Dating back to the 17th century, this elegantly landscaped square is located near the former Archbishop’s Palace and features colourful flowers, lush plants and extraordinary topiaries. The ruins of Bracara Augusta can still be seen today, a city founded by Emperor Augustus between 300 BC and AD 400. It became the Roman capital of northern Iberia and was later occupied by Visigoths and Arabs. 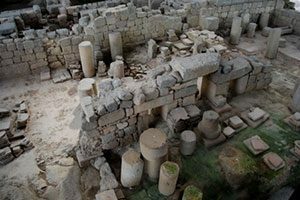 Since the 1970s, efforts have been made to preserve the complex archaeological structures that still remain. After graduating from Supelec -a French engineering school- and University of Wollongong (Australia), Vincent Barat has started his career in business consulting at Wavestone. Ori Brafman is a multiple New York Timesbest-selling author. Helke Carvalho Hernandes is currently the Deputy Director General at EFMD based in Brussels. Pilar was Human Resources Manager at Chase Manhattan Bank for over 9 years, working in Portugal, Spain and UK. Francisco Duarte holds a PhD on Software Engineering from the University of Minho. José Ignacio Latorre got his PhD in Particle Physics at Univ. Barcelona. Yih-teen Lee is Professor in the Department of Managing People in Organizations. Robin is HR Director in Cigna’s International Markets. He leads HR for the EMEA region and the Global Health Solutions business including International Organisations. Lars Montelius is the Director–General of the International Iberian Nanotechnology Laboratory since the 1st September 2014. Ramon O’Callaghan is Dean of Porto Business School (PBS), Porto University. Isabel has more than 20 years of experience in managing teams as a Human Capital Director, especially in Textile Industry and Automotive retail. Revathi embodies the belief that intentional investment in an organization’s people equates to endless success. Pedro Salomé is the group leader of the Nanofabrication for optoelectronic applications (NOA) group.